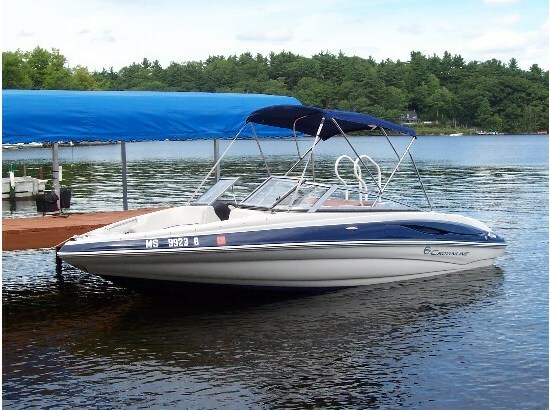 This one owner beauty has been maintained by certified marina technicians and a minimal 248 hours clocked. We have all maintenance records. Boat was fully serviced in the fall. 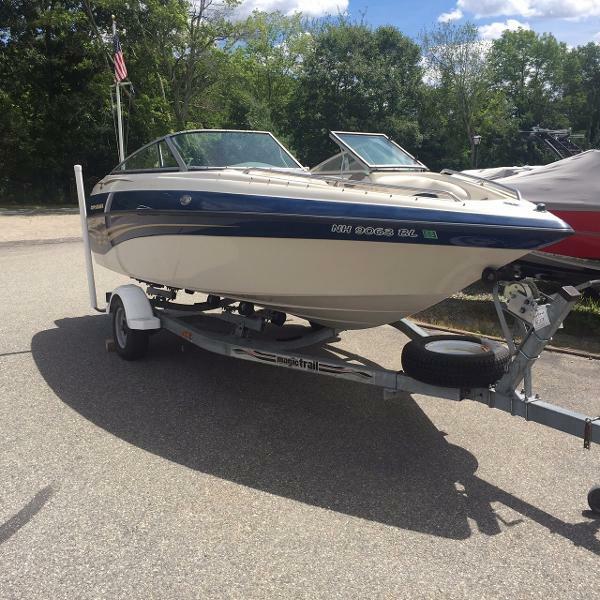 Boat has been professionally detailed twice annually for entire ownership. We are including an immaculately maintained full canvas package with newer isinglass. Boat has new batteries and has had a full tune up. This boat was built with almost every option available in 2006 including air conditioning, heat, and built in TV. This boat will be ready to go when you are. 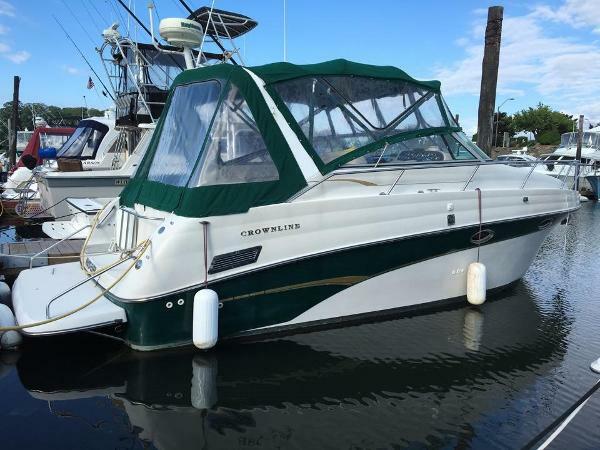 2000 Crownline 290 CR 2000 Crownline 290 CR This 2000Crownline 290 CR is powered by twin 250 HP Mercruiser I/O engines. An extra wide helm seat provides room for two, and the flip up base creates the perfect leaning post for long rides. Backlit Faria gauges and a tilt steering wheel come standard in this model. Built on a wide 10’ 4 Beam, modified V-Hull of solid fiberglass construction, the midcabin floor plan is arranged with a canted forward berth coupled with an L-shaped dinette/lounge and wet bar. The spacious lounge comes equipped with ample seating for a large crew – privacy curtains separating the sleeping areas from the main cabin and 4 opening ports and 3 deck hatches allow for plenty of cabin ventilation. Trim tabs, large fiberglass swim platform w/swim ladder. The Crownline 290 CR has stainless rails that keep fenders secure and neatly stowed when not in use. 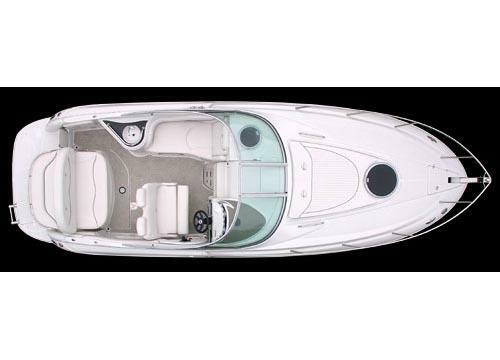 More features include built in fender storage at the transom, a walk-thru windshield, removable bench seat and recessed anchor storage at the bow with powered windlass. 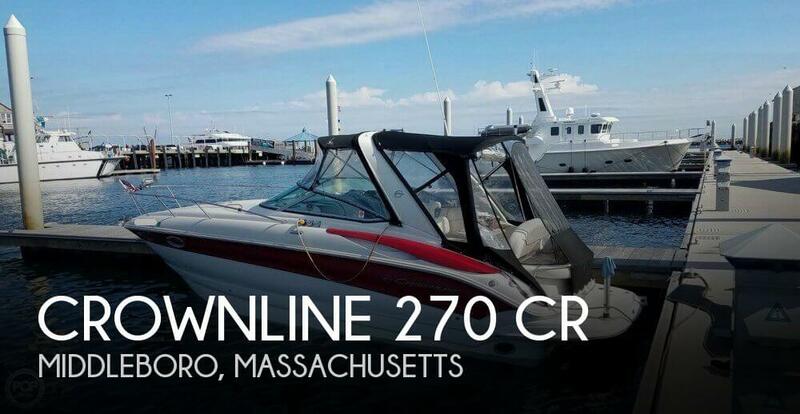 2006 Crownline 270 CR Preliminary Listing, Crownline 270 in great condition with Trailer. 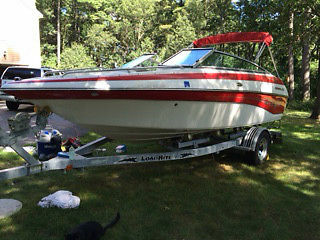 Preferred Mercruiser 5.7L MPI I/O . Garmin 198C Chart-plotter, Raymarine Radar. Air Conditioning. Full camper enclosure and mooring cover. 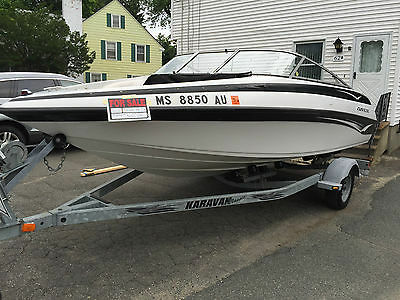 Attractive boat ready for the summer- and priced to sell. 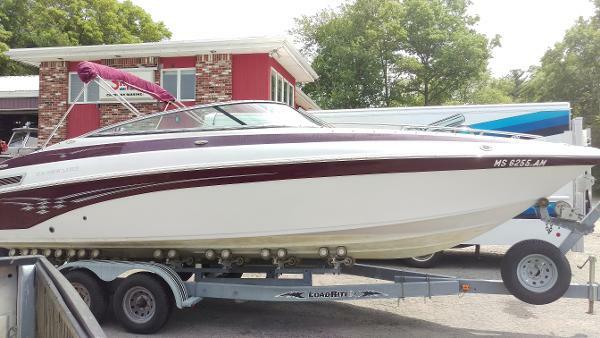 2004 Crownline 250 CR 2004 Crownline 25' Cruiser 250CR. Powered by a single 300hp Mercriser 5.7L 350Mag MPI with 435 hours. Bravo 3 dual prop outdrive. Price includes matching Load Rite Galv Roller trailer with disc brakes, and electric winch. 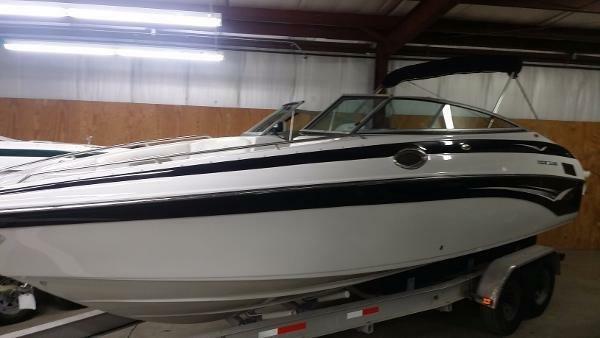 Boat has Shore power, Full galley, Dual batteries, Bimini top, Full enclosure, Cockpit carpet, GPS, VHF, Depth sounder and fish finder, Cockpit table, Cockpit sink, Remote spot light, Battery charger, Hot water heater, Full Bathroom with holding tank, Am\Fm stereo, Flat screen tv and transom shower. Sleeps four, has rear sundeck and more. Call for more info. 2003 Crownline 270 BR The Crownline 270 BR continues the Crownline tradition of using only quality components and including as standard equipment those comfort and convenience items that boaters have asked for: cockpit table and wetbar, two built-in coolers and a 25-quart portable, a 20-gallon fresh water system, portable toilet enclosure with an electric light, vent and sink. 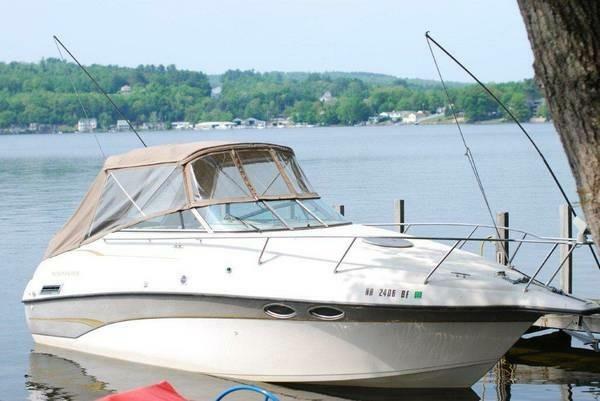 Marina maintained, excellent condition, low miles, fresh water cruiser!!! Powered with a Mercruiser 350MAG Bravo III. Approx. 195 Hours. Color: Tan/White. 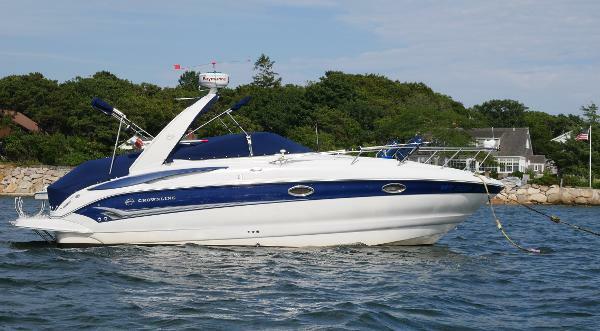 Includes: Dual-switch battery, trim tabs, depth sounder, compass, windlass anchor, remote spotlight, ac/heat, cherry wheel, fore deck and convertible rear deck sunpad, interior and exterior tables, stereo system, refrigerator, range top, microwave, head w/shower, snap down berber carpet, camper canvas, cockpit cover. $46,000. ?